Whether you’re furnishing a new home or trying to breathe new life into one you’re already living in blinds are a great way to change the atmosphere in a room. Not only that but the right blinds or shades can substantially increase the energy efficiency and overall comfort of your home by controlling the temperature of a room and how bright the room gets throughout the day. Choosing the right blinds, however, can be a daunting task as there are a wide variety of styles and materials. To try and make the task easier we’ve compiled a list of 10 hand-picked blinds including a variety of styles and designs to help you find the right window treatments for your home. To start us off we have the Delta blinds custom made aluminum mini blinds. 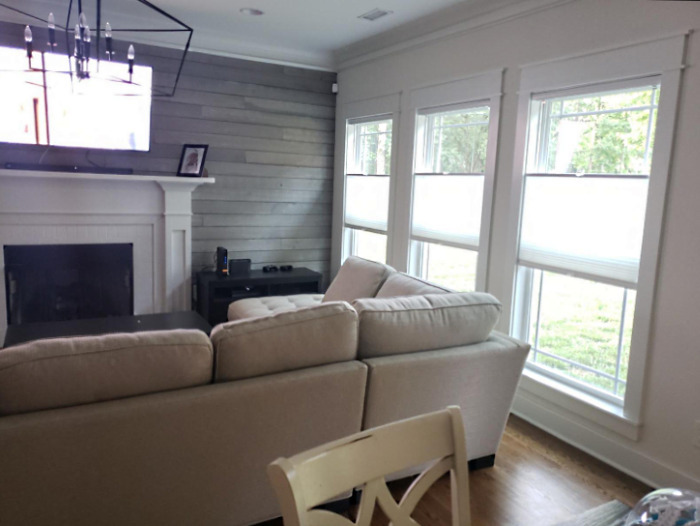 It’s not every day that you see an aluminum mini blind but it’s actually a fantastic idea to use a material like aluminum for window treatments. 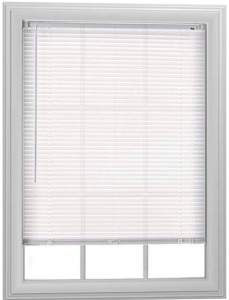 These blinds feature 1 inch horizontal slats that allow for easy adjustment of the amount of light getting in. They use a wand style twisting adjustment knob to open or close the slats and a string on the right side for pulling the blinds up or down. These blinds come in eight colors that are mostly neutral shades of white, grey, and black. There are a variety of advantages to aluminum shades which go much deeper than just lightweight and enhanced durability. The aluminum shades are given an enamel coating to give them color which makes them very easy to clean and maintain. Additionally, these blinds are NFPA 701 fire resistant which is great as blinds and curtains are often one of the leading causes of house fires. 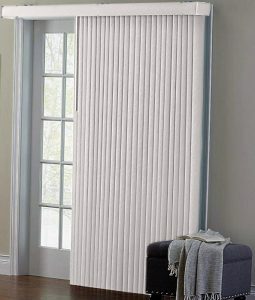 These blinds are also very easy to install typically taking between 5 to 15 minutes and come with all the necessary hardware included. Next, we’re taking a look at some gorgeous cordless single cell shades from Windows and Garden. The clean visual aesthetic of cordless shades is hard to rival and these single cell shades are no different. 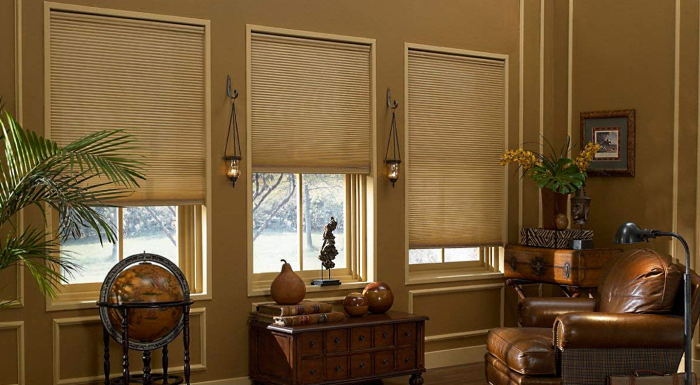 These shades come in nine different colors including antique linen, bay leaf, espresso, gold, and ivory beige. These are neutral and earth tones which should go great in almost any living room. These shades are available in a huge variety of sizes ranging from 21 to 72 inches wide and 24 to 72 inches high meaning you can put these window treatments on just about any window in pretty much any house. One of the major appeals of cordless shades such as these is that they are child safe as the cord on a more traditional style shade can pose a threat to some children who might get it wrapped around themselves. If you’re on the hunt for some simple traditional horizontal blinds then Bali Blinds has just the product for you. These standard light filtering vinyl corded blinds have a classic look to them that can make almost any space feel like home. The blinds have one-inch slats and a chord on the right for raising and lowering the blind as well as a wand on the left for opening or closing them to let the desired amount of light to come through. These blinds feature a vinyl plastic which is easy to clean and filters the light allowing some natural light to still come into your home when the blinds are down. This comes down to personal preference as to whether you want light coming in or if while the blinds are down you want all light to be filtered out. 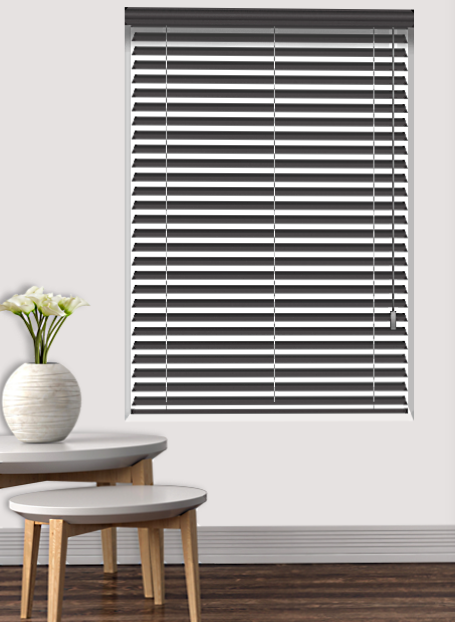 These blinds only come in white and are available in a limited selection of sizes but the durable moisture resistant vinyl makes them ideal for high moisture and high traffic areas such as kitchens or bathrooms. If you’re looking for a window treatment for a glass door then Brylane Home offers gorgeous embossed vertical blinds. 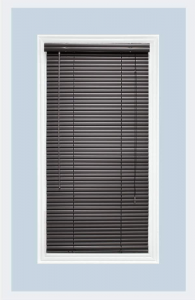 These blinds hang from above the window or door and have a single wand style handle that allows you to move them along a track at the top as well as twist the handle to open or close this slats more. 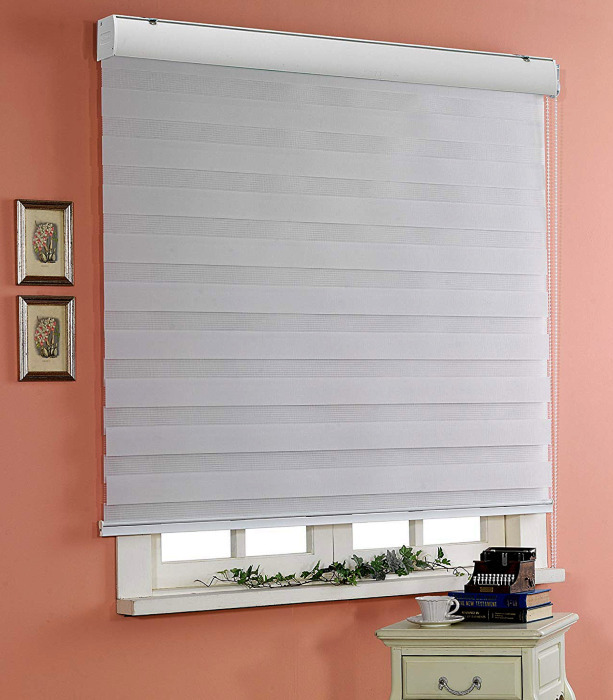 These blinds are available in five colors including gray, light taupe, white, and even red. 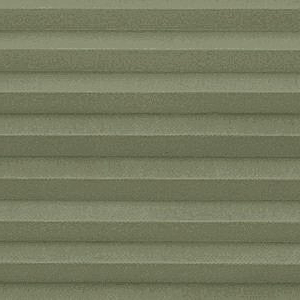 The contemporary look of these blinds can easily complement most modern decor and the available sizes make it easy to cover tall windows or sliding glass doors. Glass doors can present a huge issue from an efficiency standpoint as the streaming in of sunlight can heat up the house during the summer and the large pane of glass can allow heat to escape during the winter. These blinds can help with that in addition to allowing you to control the amount of light coming in to make the lighting in your home comfortable year-round. Next on our list is a rather unique set of dual roller zebra style blinds from Foiresoft. These window treatments combine the style of a shade with the adjustability of more traditional blinds by having slats that alternate between solid fabric and a more translucent sheer fabric. On the right side of the shade is a roller string which can raise or lower the shade while at the bottom is a second roller which allows you to move the entire shade to either allow more light through the sheer part of the fabric or block out more light with the solid stripes of opaque fabric. These shades are available in a tremendous selection of 17 different colors including pink, peach, gold, purple, or simpler neutral tones such as grey and white. They’re also available in a decent selection of sizes as well as with or without professional installation. For those who like the look of larger slats on their horizontal blinds Arlo blinds offers these gorgeous 2 inch faux wood blinds. 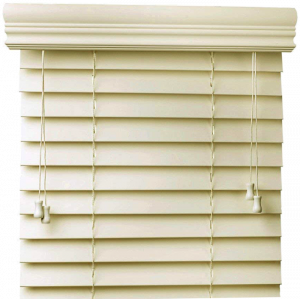 The roller at the top of these blinds has an elegant-looking cover which is enhanced by the beautiful faux wood slats which are 2 inches wide and overlap each other considerably blocking out more light than an average blind. The string on the right controls how high the blinds are while the strings on the left allow you to adjust how open the blinds are. 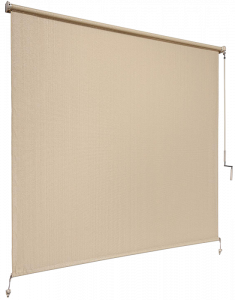 The traditional design of this blind is elegant yet somewhat understated meaning it will make a great addition to most rooms in a house. This versatile design is further enhanced by the fact that the blinds are available in almost every size imaginable meaning they’ll fit just about any window. The blind only come in two colors however which are a pure snow white and a more ivory off-white. If you’re looking for a simple understated shade that offers tons of adjustability then the Linen Avenue cordless light filtering shade with top down bottom up adjustment might be just what you’re looking for. These shades feature a single cell design which still allows some light to pass through the fabric meaning that these are not complete blackout shades. They are available in six colors ranging from crystal to black and dark brown to a simple gray. The roller at the top features a simple cover that matches the shade color of your choice. The unique part about this shade is its top down bottom up adjustment system which allows you to move the bottom of the shade up or move the top of the shade down meaning you can let light in through the top of the window rather than the bottom. When the shade is pulled down from the top two strings from the roller to keep it suspended in the air. This is great for windows that might face directly into the sun at certain times of day as when the sun is low on the horizon you can open the top of the shade to let some light in while the portion of the shade at the bottom of the window will block the direct sunlight. This unique adjustment system also makes this a completely cordless shade meaning it is safe for homes with children and pets. Next in our roundup is a shade with a unique design perfect for those who like a natural look in their home. These Roman-style shades are made from natural bamboo which gives them a very natural-look and finish. There are six finishes available depending on whether you like a darker looking or lighter looking wood but every shade retains the natural look of the bamboo that the shades are made of. 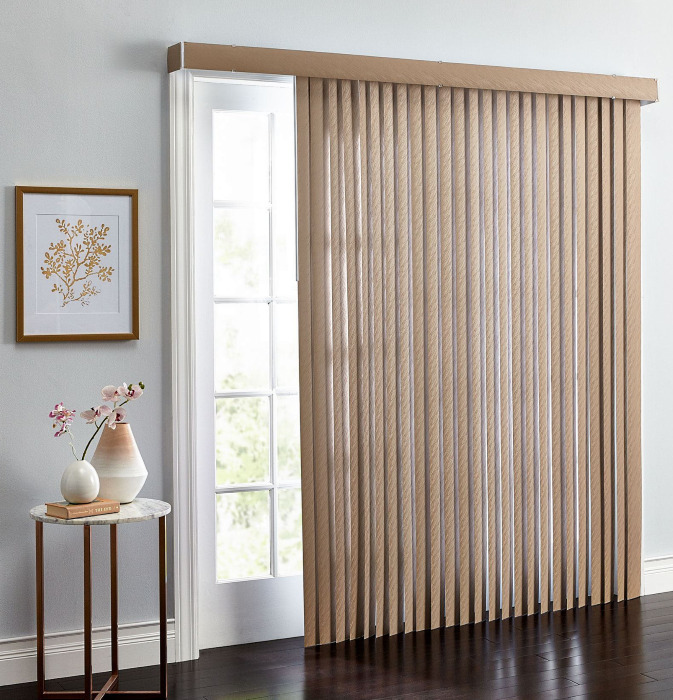 These shades feature a valance at the top which adds to the distinguished and elegant look of the bamboo and use a simple chord on the right to raise or lower the blinds. These blinds also come with a variety of mounting hardware which allows you to put the shades on the inside or outside of a window frame. It is important to note that with the minimal processing given to the bamboo the shades are made of means the actual color of the wood may vary from piece to piece and perfect consistency shouldn’t be expected of raw wood products such as these. 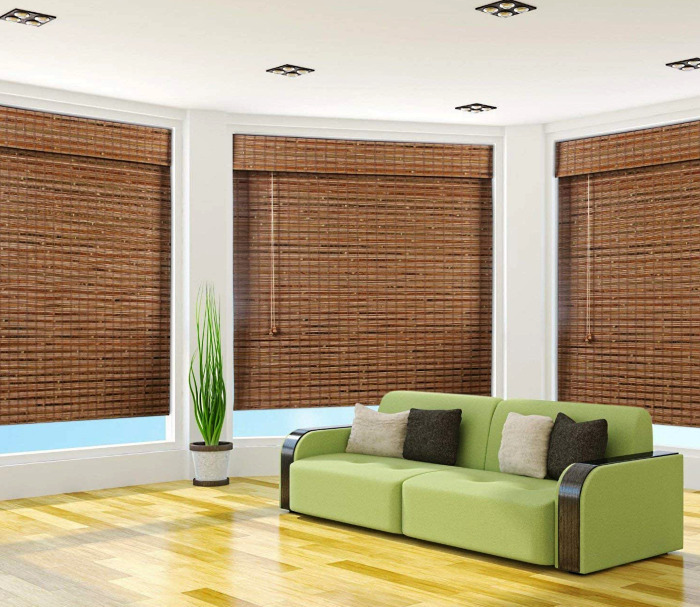 The last set of shades we’re going to be taking a look at are the Luxr blinds real wood horizontal window blinds. 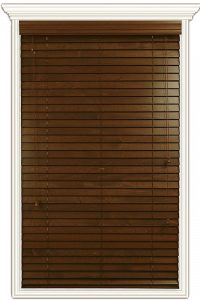 These blinds feature relatively wide 2 inch slats made of real wood from which you can choose a variety of options including pecan wood, mahogany, golden oak, warm cherry and others. The rich wood color adds a beautiful traditional look to almost any space in a home. 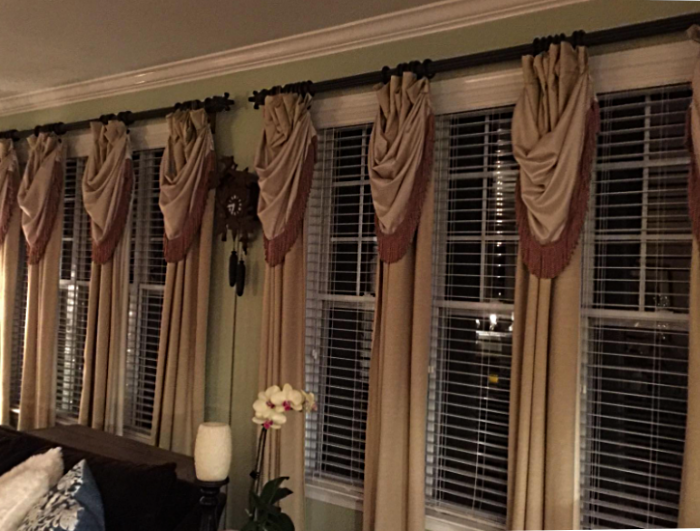 These blinds use a two drawstring design with the strings on the right lowering and raising the shades while the strings on the left open or close the wooden slats. These blinds are available in a huge variety of sizes since they are custom made but this also means that they can take a considerable amount of time to be prepared and shipped. Many people don’t realize that outdoor blinds even exist. 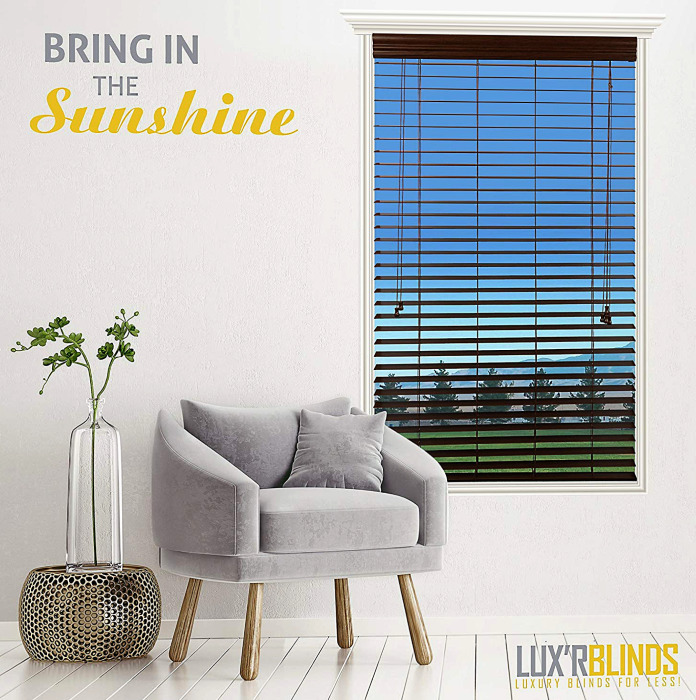 If you have an outdoor space such as a patio or balcony that often gets too hot when in direct sunlight then outdoor blinds such as these can be a lifesaver. These particular cordless roller shades from Coolaroo boast an aluminum headrail that offers incredible durability even outdoors and a knitted breathable fabric for the shade itself. The shade comes in a light almond color or a darker sesame color as well as a small variety of sizes ranging from 4 by 6 feet to 10 by 6 feet. These shades keep your deck cool and help make a more energy efficient home by blocking up to 80% of the UV rays coming in from the Sun. While they do feature a cordless design they use a crank handle to raise and lower the shade which is not weather resistant and must be taken off when not in use. Now that you’ve had a look at 10 of the best hand-picked blinds that we were able to find you may have some questions. So below we’ve compiled some information about different types of shades which should answer many of your questions and help you find the right shades for you. The first important distinction to understand is the difference between blinds and shades. Blinds use a series of slats that are usually made of a hard materials such as plastic or wood and these slats can be adjusted individually to change the level of light coming in. The blinds can then also be raised or lowered to allow even more light in. 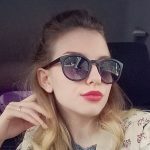 Shades on the other hand are usually made of a single piece of material meaning the only way to change the amount of light getting in is to raise or lower them. 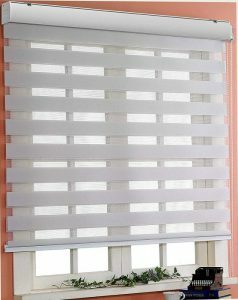 Blinds also come in a variety of styles that are usually defined by the orientation and size of the slats. Some lines which have vertical slats are usually designed for use around tall windows or glass doors while horizontal blinds are used on traditional windows. 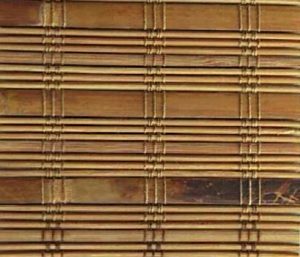 Older styles of blinds will have 2 inch or 1 and 1/2 inch slats while more modern “mini blinds” have 1 inch or even smaller slats making it even easier to adjust the amount of light coming into your home. Which of these designs you choose comes down entirely to personal preference as blinds are normally more adjustable but shades typically have a sleeker and more elegant look to them. An important factor to consider when choosing the right blinds for your home is what do you have children or pets around as some blinds and shades can pose a threat to young ones and animals. 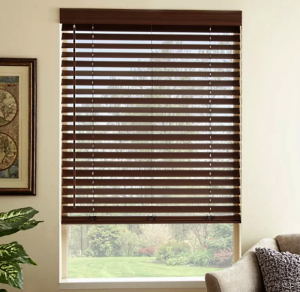 Any blind that has a string which is used for raising or lowering the blinds can be hazardous around small children and pets and you should always try to use cordless window treatments in a home that is going to have young children or animals. We hope that our brief buyer’s guide has armed you with the knowledge to make an informed decision on what kind of blinds or Shades you want in your home. Blinds are a great way to add comfort and style to any home as well as improve the energy efficiency helping you live a greener lifestyle. The 10 window treatments on our list where handpicked to ensure that no matter which one you select to put in your home you will be satisfied with their performance and look. I'm Violet Griffin, I work as a sales-consultant in a interior design agency. On the pages of my blog, I want to share my opinion on the selection of the interior design elements for your home and help you make living at home more comfortable.